Rescuers work at a collapsed house following an earthquake in Amatrice, central Italy, Aug. 26, 2016. As the day of national mourning begins in Italy, hope is fading Saturday among rescuers after coming back from another search operation empty-handed with their sniffer dogs. They concede the chances are low of finding anyone alive in the ruins and piles of rubble and masonry of Amatrice, the central Italian town flattened by Wednesday’s earthquake. Not that they were advertising that to the locals, who are praying that more of their friends and relatives will be pulled alive from what remains of a town that traces its history back to the Romans and Lombards. Italian President Sergio Mattarella, guided by Amatrice's Mayor Sergio Pirozzi, visited the town Saturday and thanked rescue workers. Mattarella will attend a state funeral for some of the earthquake's victims. The president was taken to the edge of town to see some of the damage. Officials say it is too dangerous to actually enter the medieval town. Days after the powerful earthquake virtually destroyed this once picturesque town, famous for supplying cooks to the Vatican, there is a sense now that all that remains to be done is to recover the bodies of about 15 people, including children and a baker, who remain unaccounted for by their families. On Friday, another severe aftershock — this time measuring 4.8 - forced rescuers, some dispatched from as far away as Salerno in Italy’s south to Bologna in the north, to suspend their work for a time in the historic center of Amatrice, the worst of a string of towns impacted by Wednesday’s trembler. With more than1,000 aftershocks felt in central Italy since Wednesday, emergency crews decided Friday to seal off Amatrice from both the media and volunteers. They warned it had become far too dangerous as the town’s mayor, Sergio Pirozzi, warned that what is left of Amatrice is now at risk of being cut off because of severe damage to the roads winding up to the hilltop town. A man is given personal belongings after rescuers recovered the body of a woman from the collapsed house, in Amatrice, Aug. 26, 2016. Officials say more than 200 bodies have so far been retrieved from Amatrice’s collapsed houses, some dating back to the 14th century. “Only a miracle can bring our friends back alive from the rubble, but we are still digging because many are missing,” Pirozzi told reporters. On the outskirts of the town, firefighters started to seal off a group of houses that had been crumpled by the violent shaking of Wednesday’s quake. The interiors were exposed to the sun and in one where the floors had collapsed on each other, all that could be seen was a Marilyn Monroe photograph and a mattress. There have been few reported rescues in the towns leveled by Wednesday’s 6.2 earthquake, adding to the sense of despondency beginning to grip the exhausted emergency crews. The death toll is approaching 300 along with several hundred injured in the four towns most severely impacted by the original quake, Amatrice, Arquata, Accumoli and Pescara del Tronto, which all suffered severe damage. All four are usually sparsely populated - Amatrice has a year-round population of 2,500 - but the numbers were swelled by tourists and relatives visiting for the summer and that has made it difficult for authorities to pin down who remains missing. 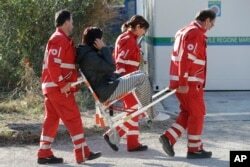 An earthquake survivor is carried by Red Cross staff in a tent camp set up as a temporary shelter following an earthquake in Pescara Del Tronto, Italy, Aug. 26, 2016. 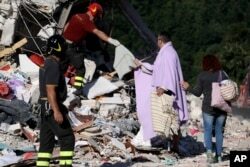 In Pescara del Tronto, about 30 bodies have been recovered in the past few days. “We have removed the last bodies that we knew about,” said Paolo Cortelli, a member of the Alpine Rescue national service. “We don't know, and we might never know, if the number of missing we knew about actually corresponds to the people who were actually under the rubble,” he cautioned. Romania’s Foreign Ministry said 11 Romanians visiting or resident in the affected area were still missing. Several vacationing foreigners have been confirmed dead, among them six Romanians, a Spanish woman, a Canadian and an Albanian as well as three Britons, including a 14-year-old boy. Mayor Pirozzi says Amatrice, which survived another major earthquake in 1639, should be rebuilt as a tribute to those who lost their lives midweek. He urged youngsters not to give up on the town, which gave its name to the pasta sauce, all’amatriciana, saying they should not leave the area and if they did it would really mark the end of Amatrice. "No night can last so long that the sun never rises again. I am convinced that Amatrice will rise again. We owe it to the 207 people who died here,” he said. Italian Prime Minister Matteo Renzi, who declared a state of emergency Thursday in the affected areas, has promised to rebuild the shattered towns and pledged an immediate $55 million in funds for relief and rebuilding. Far more will be needed, say experts, who point out that more than 8,000 people still live in temporary accommodations from the 2009 L’Aquila quake. A Virgin Mary statue is seen in cemetery following an earthquake at Sant' Angelo near Amatrice, central Italy, Aug. 26, 2016. A half-dozen historically significant houses of worship in Amatrice alone have been destroyed, including the Church of Sant’ Agostino, which boasted a famous fresco of the Annunciation and Madonna with Child and Angels, and the Church of San Francesco, which dated back to the 14th century. Of the most important sites in Amatrice, only the 13th century Civic Tower withstood the quake. The towns damaged near the epicenter aren't the only ones that will be appealing for government funds. 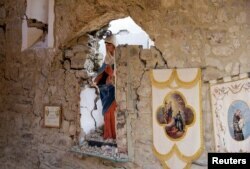 According to the country’s culture minister, Dario Franceschini, 293 culturally important sites, many of them churches, either collapsed or were seriously damaged by Wednesday’s quake and the 920 aftershocks recorded since across central Italy. The cathedral in Urbino, 272 kilometers to the north of Amatrice, has suffered cracks in its structure and the Monastery of St. Chiara in Camerino, 100 kilometers from the epicenter, also has suffered damage.